The Thirty Years War was from 1618 to 1648 and was one of the bloodiest, most destructive conflicts in human history. The roots of the war grew out of conflict between Catholics and Protestants but over time the war spread to involve most of the great European powers of the age and became much less about religion and much more about political hegemony. The destruction brought by the war had a far reaching effect and was one of first examples of the concept of total war where civilian loss of life far outpaced battlefield losses through a combination of disease and famine. In some nations, total population had been reduced by as much as 25% over this thirty year period. As such a militarily diverse period of history with so many belligerents involved, the types of figures we can create is limitless. And of course all will be done to our extremely high levels of sculpting and painting. We have launched the range with a release a bit on the lighter side with our rendition of the “Three Musketeers.” These figures have an even higher level of sculpting and painting then our normal figures and we sincerely hope you enjoy them. 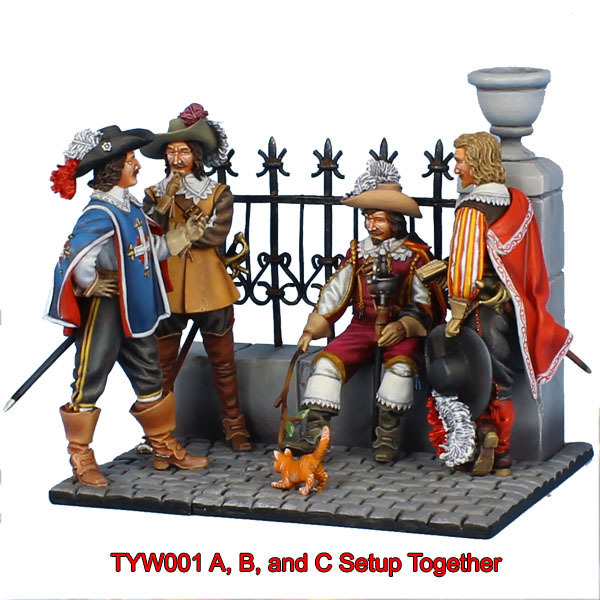 In tihs sub section of our Thirty Years War range will produce figures of and related to the Three Musketeers, Parisian city life of the period, and other vignettes that are not direclty related to the field battle of the period.